We finally remembered to bring the second pump we brought to Kenya along with us to Kwa Njenga today, just in time before we leave and as the team is installing the fourth shower. Before heading to Amusha, Davies brought us to SIDAREC to purchase the women's beadwork Kwamboka told us about yesterday. 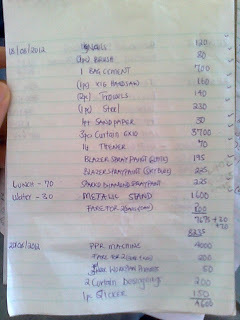 We bought 2650 KSH worth of jewelry, about 15 pieces. Hopefully they'll sell well when we fundraise for EWB this year. Back at Amusha, Daniel and Davies were working on installing the fourth shower, with a wooden frame, in front of the center. Another group was finishing up the cement base of the shower with a metal frame at Sisal, a tricky process as they try to angle it so the water drains out into a pipe they directed to a nearby sewage ditch. 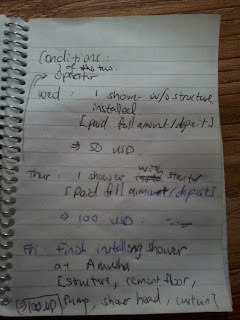 George informed us that the shower with the wooden frame at his place near Sisal already earned him 100 KSH yesterday. 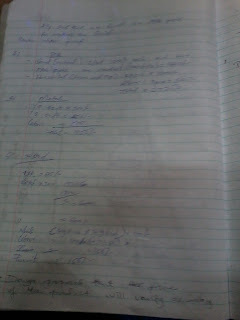 He's charging 5 KSH for cold water showers and 10 KSH for hot water showers. When we got to Amusha, a group of primary school teachers led by one of yesterday's marketing session attendees was waiting to meet with us. The women told us about their schools and then brought us over to show us one. The classrooms are pretty small, with structures made of corrugated iron sheets, and the only light inside comes from a small window. The students' families pay 300-400 KSH a year for them to attend, though some students are orphans that aren't required to pay. Each classroom fits 15-20 children in about a 10'x10' space. The rooms are stuffy and dim. The teachers told us about a girl who donated 20 lockers, like this one, to the school. The two rooms on the right are for ECD (Early Childhood Development). The teachers call them the "baby rooms." The room on the left is the kitchen, where they make breakfast for the students. The reason they have a kitchen instead of another classroom is because this sewage ditch goes right under the room. During the rainy season, the whole plot is drowned in water. We're not sure what potential EWB projects we could start to help out with the situation, but we'll be talking with the teachers over email. Back at Amusha, to celebrate our last day, we brought some popcorn and candy for everyone! 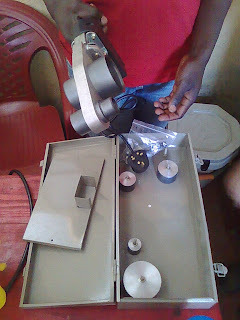 After checking up on the work at Amusha, we went to the other site where Kwamboka holds jewelry training for women to purchase more jewelry for fundraising (SIDAREC had a limited supply of samples since the women weren't there at the time). Two of the women who made the jewelry, along with Kwamboka (on the right). Our Eco-Shower chairman made us some earrings. Davies showing off Kenyan pride! Isaiah connecting with his feminine side. We bought 1000 KSH more of jewelry there. The team sent us off at the end of the day, and we set some goals for them after we leave. We're aiming to sell two showers a week, with about thirty more showers installed by the end of this year. George is working on setting up the bank account, and hopefully by the time our travel team returns next summer, Eco-Shower will be a full-fledged company. 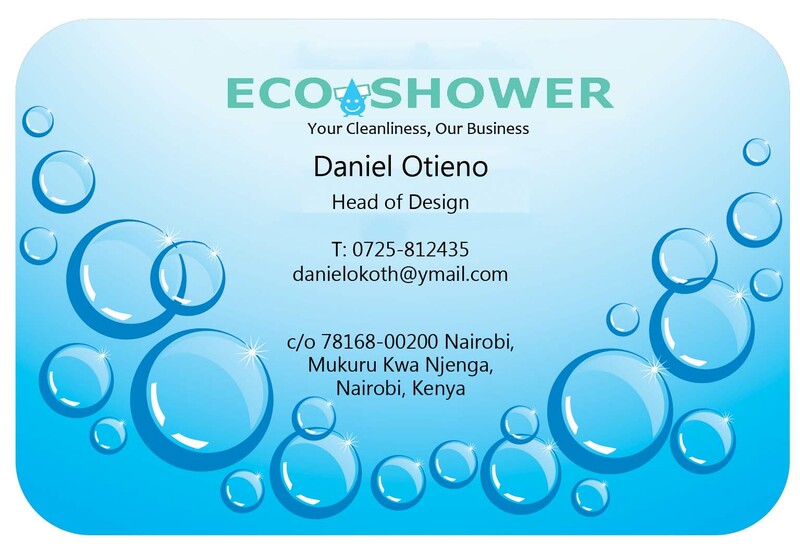 The group has done some fantastic work in the short time that Clara and I have been in Nairobi, and we're confident that they'll be able to bring Eco-Shower to even greater heights in the near future! Marina from Mascorp, Ken from Inuka Kenya and Bonface visited Amusha today. Marina is the project-manager at Mascorp, in charge of funding projects for youth groups. They came to see the projects going on at Amusha to get a feel of the activities at the ground. After talking briefly about the application process for funding from Mascorp, we demonstrated our shower to them. They seem interested and impressed by the shower. 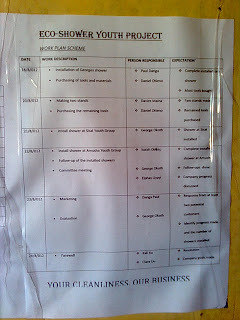 If Amusha’s application for funding is successful this round, they will be awarded 40,000KSH in a few weeks. As we were walking to meet Shadrack, Bonface talked to us about the two projects he is currently working on. Bonface is an ambitious young man who is looking to start his own business. 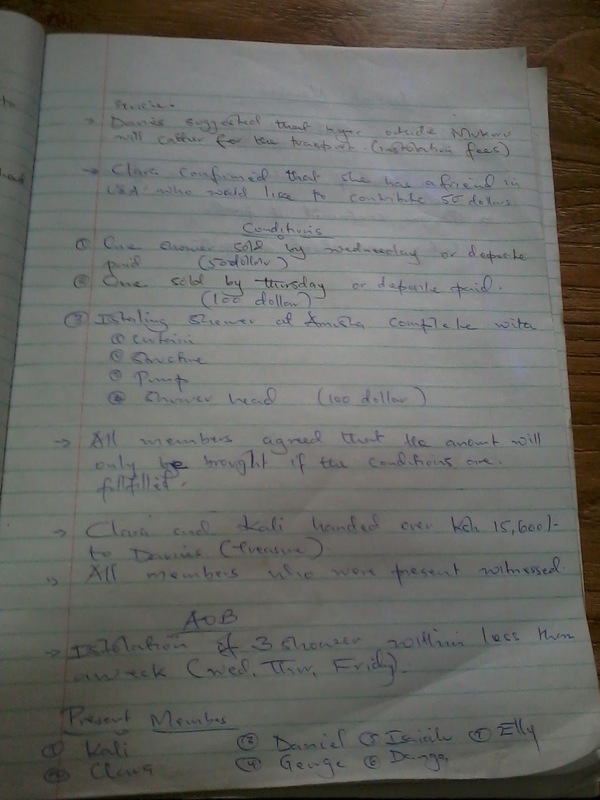 One of his research is on sewage purification. The project started out as eliminating the sewage smell but shifted to sewage purification as they realized the sewage is purified in the process. Bonface says he worked out the purification process but the project still needs funding and government authorization before commercialization. The second project is on recycling plastic to make rods, which can replace metal and wood structure. The research for this project is still ongoing. Bonface will let us know more details through email so we can look at the possibility of collaborations. We head into a church where the heads of various groups have gathered. 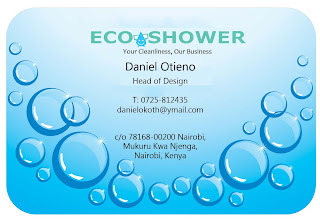 Isaiah and Davies introduced Eco-Shower to the group. There was a long question and answer session in Swahili afterwards. Although we do not completely understand the conversation, from the occasional laughter from the crowd, everyone seems to have had a good time. The questions ranged from where the shower can be placed to warranty issues. Isaiah tackled each question skillfully. The heads seem to be satisfied with his answers. Hopefully some of these people will turn into our customers. As we are ending the session, the leader from a disabled group came up to us. The group is trying to make candies for sale, but they have a problem cutting the candies into pieces after it solidifies. 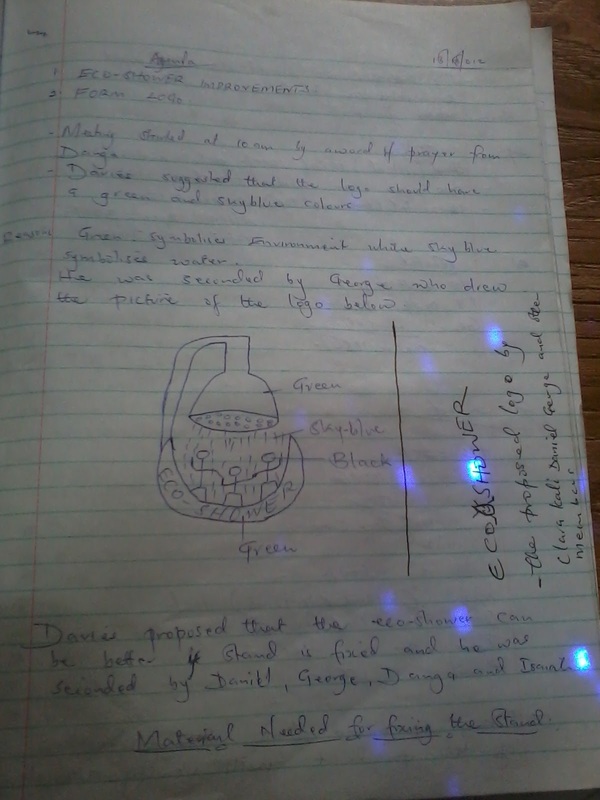 He asked if we could came up with a method that makes the process easier and cleaner. The exact process is not really clear to us. We hope to talk to him more about it if he comes to our workshop tomorrow morning. This is the shower installed at Sisal with wooden structure. 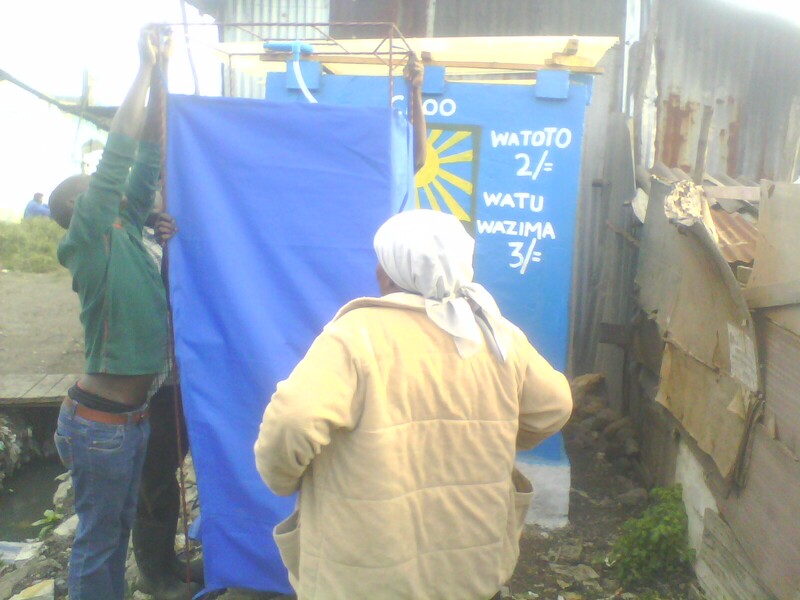 Another showers is installed at Kwa Ruben for a week-long testing. The operator who is interested to test out our shower. This is half-completed shower at a vendor near Sisal. He ordered a metal stand. He even placed a water tank near the shower so water can be easily refilled into the shower. Amusha will be monitoring the sales and making further improvements to the showers. 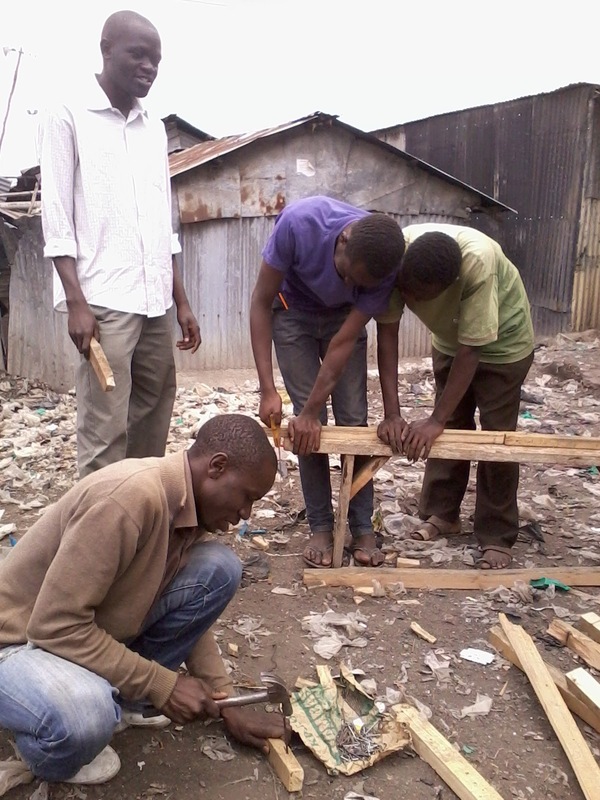 A committee meeting with all the important people in the slum was ongoing at Amusha’s workshop when we arrived today. After their meeting, two of the people, Shadrack and Christopher, came to talk to us. Shadrack Wayodi is the village chairman of Milimani. A village chairman is in charge of security of the area. Christopher is the Mukuru Service Network Secretary. He is also a human rights activist, involved in amnesty international, coordinates advocacy forums. We talked about possible project collaborations. They did not have very specific projects in mind but are very interested to get people involved in technology related entrepreneurship. 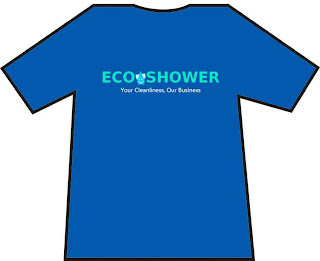 They liked the idea of Eco-shower a lot and hope we can come up with more products like that. We arranged a meeting tomorrow at 1pm to discuss more about projects and a platform for us to meet other youth groups to market our showers. Random facts we learnt. Mukuru Kwa Njenga is divided into eight villages. 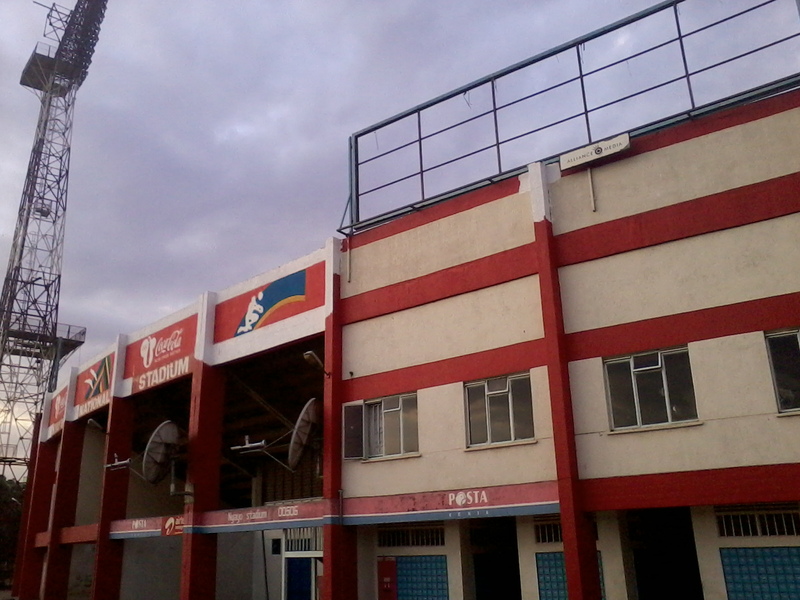 Milimani (where Amusha is located), Vietnam, Riara, Motomoto, Aa, Wapewape, 48 and Sisal (the biggest area). 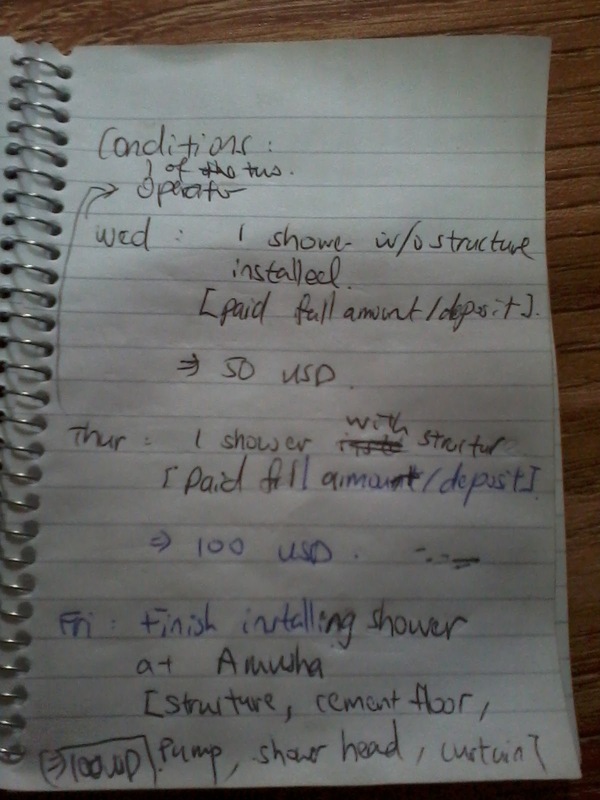 The execuctive made a very detailed plan for the week. The goal is to install 4 showers by the end of the week. The team bought a new ppr machine over the weekends. On Monday, a team went to Kwa Reuben to install the shower with metal frame at Mama Gathoni’s (tel: 0723875033). She is also one of the operators of Sanergy’s toilet. On the next day, the team went back for a follow up of the shower. Mama Gathoni suggested a bigger frame, 3’ by 3’ for the shower. So the frame was sent back for modification. 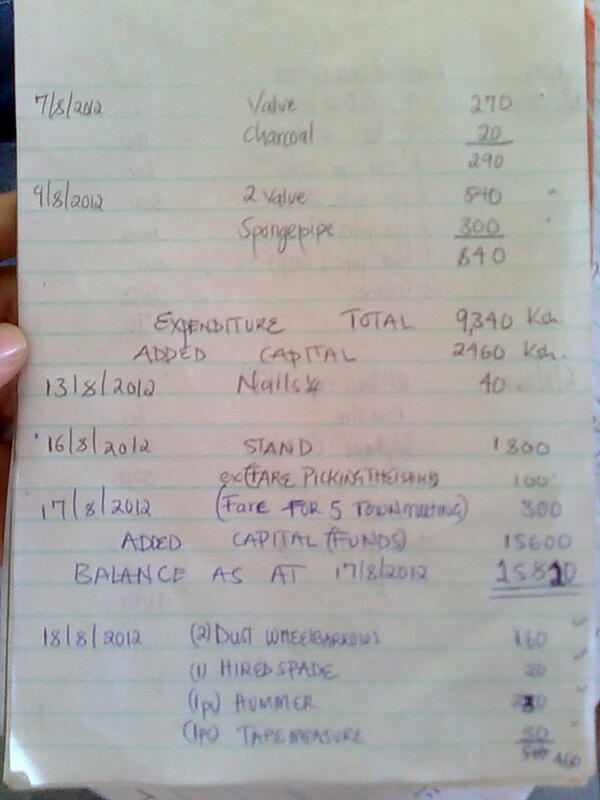 The frame costs 1600KSH to manufacture and 1800KSH for our modifications at a welder’s place. Richard is actually a welder but currently we do not have the machines to manufacture those parts in house. 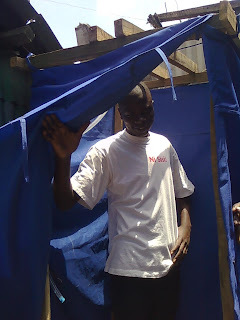 Geroge’s shower was moved to Sisal, installed with a wooden frame and blue canvas curtain. The shower looks pretty good with the cemented floor, painted pump and the showerhead secured. 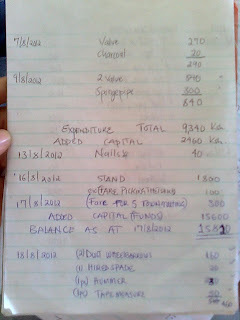 Sisal paid a deposit of 300KSH for the shower. 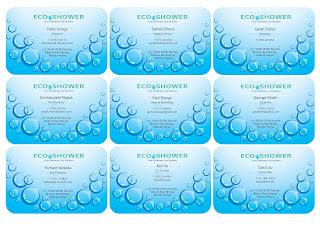 Davies' record of eco-shower spending. 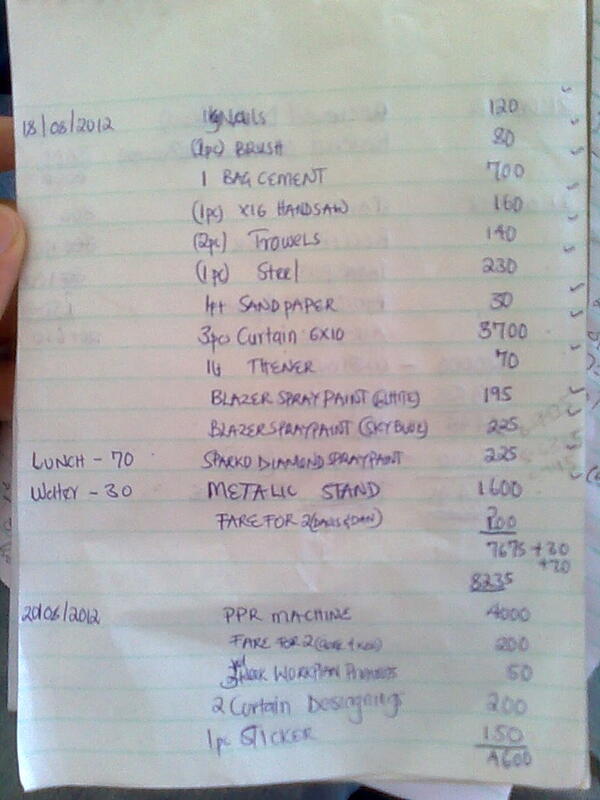 The team bought some materials necessary for the shower as well as check book and stamp for the company. The current balance stands at 9495KSH after taking into account the contribution (2000KSH), deposit from Sisal (3000KSH) and expenditure (13505KSH). Daniel told us many of the executive team members actually want to go to college but lacks the financial ability. School of Arts and Education costs 120,000KSH per year for tuition alone and 150,000KSH per year including living expenses. School of Science costs 230,000KSH per year exclusive of recreation. 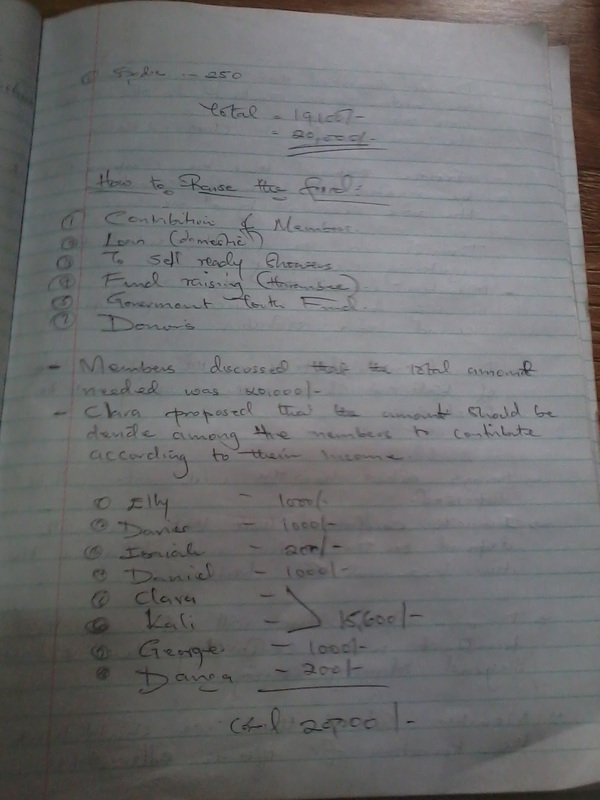 Accounting, which is what Davies wants to study, costs 150,000KSH. Strathmore is the most expensive business school in Kenya, costs 230,000KSH. Even with a college degree, one needs 2-3 year experience to get a job. To get the experience, one has to pay even more. The expensive education structure is why so many youth could not afford to go to school and works at youth center. It seems like we need to sell a lot of showers in order to send everyone on the executive team to college. But there is hope and I really wish one day we could send our team to colleges with the profits from the showers. In the morning, we dropped by The Print Shop at the Afya Center to check up on the T-shirt printing. Good thing we did, because the computer we'd uploaded our designs to had crashed and they had redone our design. It ended up looking much more like the original logo I'd drawn after some major editing though. The shirt redesign and printing took longer than we expected, so we asked Davies to come pick up the shirts and business cards when they were ready. Clara and I headed to the Yaya area for lunch with Ken and Ella, my GRTs from last year who recently moved to Nairobi to start their own businesses, mSurvey and SasaAfrica. While it was great to catch up, they also had some interesting insights into our project. Ken said he'd actually been consulted by Showergy a while ago when the project was in its earliest stage. Ella used to work for Sanergy (as the CTO and a co-founder) and was the chief architect behind their engineering solution, so we talked a little about the structure of our shower and the possibility of using cement for the floor. She told us that long-term, cement is cheaper than wood, which is scarce around here because there aren't many trees, as we noticed early on. Wood also rots easily with water coverage. Ella, Clara, and Ken dwarfing me. In the evening we hung out with Joseph, a 2011 MIT grad working at Sanergy, at the Ukay Center/Westgate Mall, a pretty wealthy area that Joseph informed us is an Indian hub. We bonded over a Yanni CD we saw at a music store and our disgustingly unhealthy love of McDonald's. We had dinner at Hashmi's, a really good Indian barbecue restaurant that he'd suggested to us when we had dinner with the Sanergy folks. While we were discussing our project progress and plans for the next week, Joseph suggested we look for nonfunctional showers in the community and offer to replace them with our own. It sounds like a feasible idea, considering almost every community project we've seen here is something that was started and never finished due to lack of funding or lack of anyone taking responsibility after the project initiator (usually a foreign donor) left. I have yet to see one operating community bathroom. We had a really constructive meeting today at Pizza Inn after treating the team to lunch for their hard work over the past two weeks. 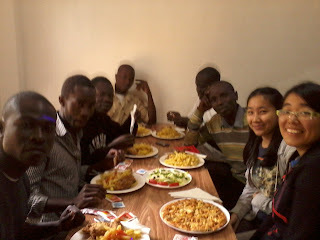 We started ordering lunch from Sanergy's lunch vendor on Tuesday (at 30 KSH per person for a meal...36 cents!! ), but figured a lunch out together would be good for group morale. Some of the guys weren't used to eating so "fancy," so there was a lot of joking around and poking fun at each other. "I have too been somewhere like this before...ok I admit, it was before I was born." Unfortunately the waitress didn't have very steady hands. The guys were pretty excited about the lunch, so there was a lot of energy at the table. The first thing we discussed was funding, their most immediate concern. 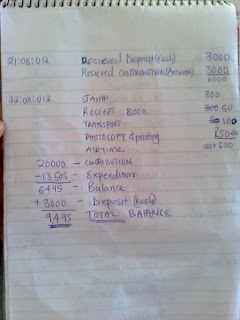 They had 400 KSH left from the 3000 we handed over to Davies (our treasurer) last Friday. 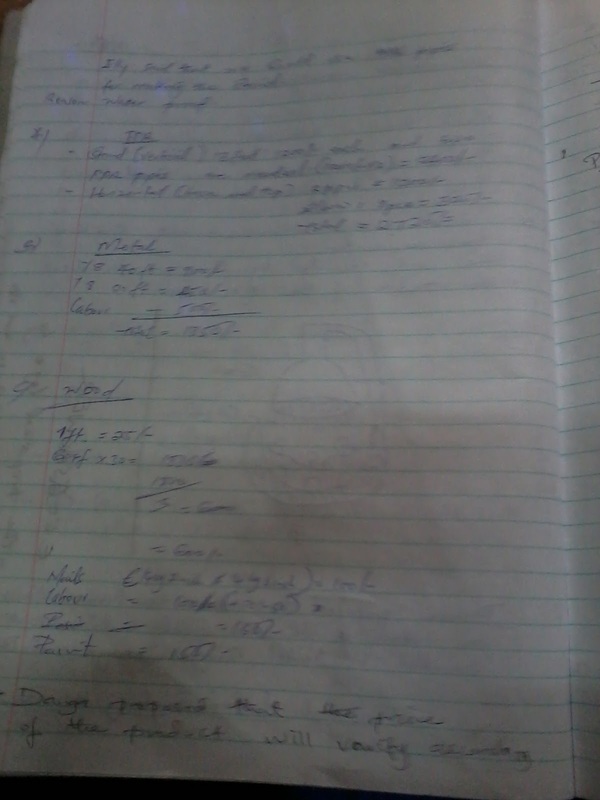 However, after totaling up the costs of all the materials and tools needed to finish the first three showers, 20,000 KSH is needed. We asked each person present to pledge whatever amount of money they were able to give by Sunday, considering it an investment in the company that would be returned later on. 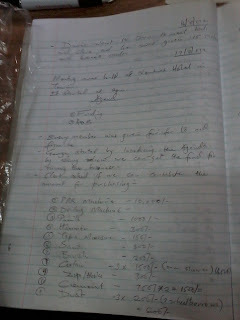 Clara and I covered the 15,600 still needed with our leftover EWB materials funding. 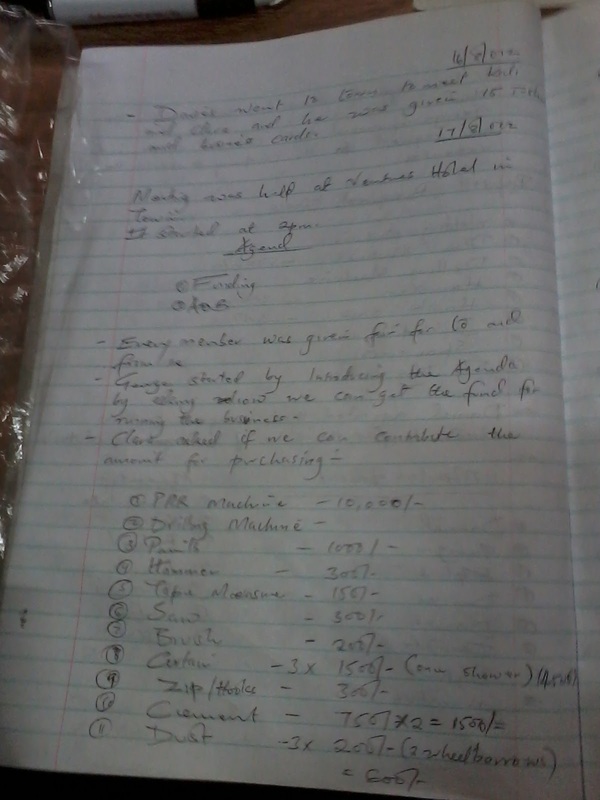 George brought up registering the company, which he had mentioned earlier, so that we could open up a bank account. However, since it's a lengthy, expensive process (30k+10k for a lawyer), Davies suggested opening a second account under Amusha or Sisal's certificate for now instead. They asked whether they could list Clara and I as members when they register the company, which we weren't sure about. Since we're leaving next Saturday, they probably won't have that sorted out early enough. We talked a little more about the shower base and drainage, not exactly coming to a conclusion because they decided that it all depends on the drainage situation of the area the shower is being installed in. They're going to use cement for the base, though the exact design is still not settled. They figure that operators who buy the shower will probably have access to drainage nearby, since those most likely to buy are located near water points and bathrooms. 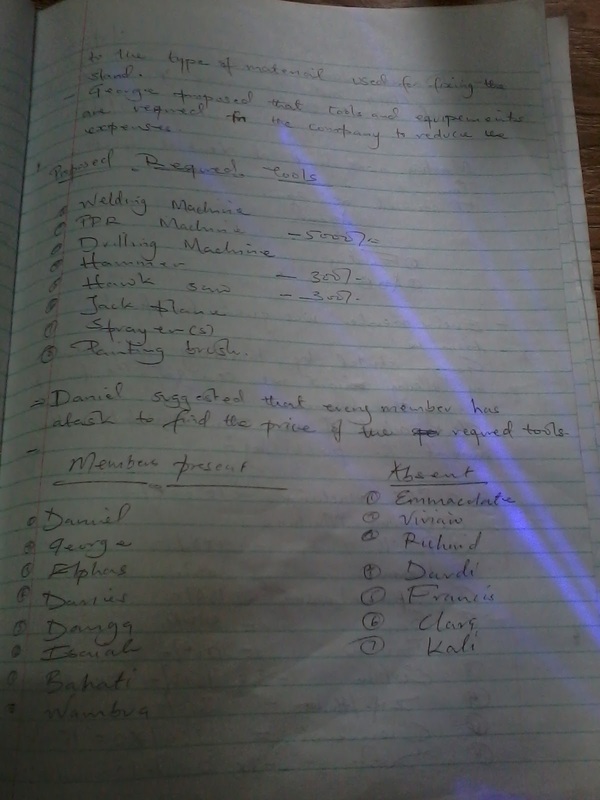 Danga brought up transportation fees, asking who would be paying for them when installing the showers outside of Nairobi. After spending a while discussing some pretty far-fetched possibilities, the team decided that an installation fee should be charged when installing outside the Mukuru area. Though Clara and I thought the conversation was productive, we thought they needed some incentive to actually get things done now instead of continuing to toss around ideas for an indefinite period of time. We gave them three conditions and certain amounts of funding they'd be given if each condition was met on time. We said that our friend/team member in the U.S. was pledging to fund them. This gave them much more motivation because otherwise the funding would have been very tight, and we think these concrete goals will help them get down to business and follow through on their promises. We're hoping to have one shower without the metal or wooden frame installed, one shower with the structure installed, and one full shower installed at Amusha. At least one should be with an operator so we can check up on how many people are using it, how much the operator is making off of it, and how the shower itself does in the long run. 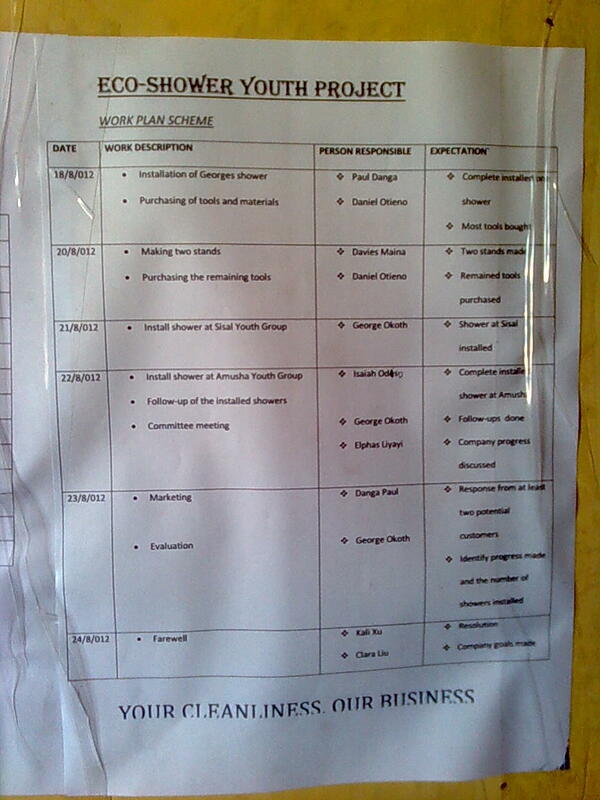 The guys were really happy about this offer and organized their own meeting after going back to Kwa Njenga to start planning to meet these goals. 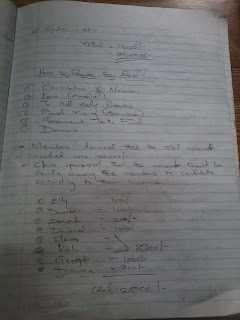 Our secretary Isaiah takes super detailed notes! Really helpful for meetings they have when Clara and I aren't present. 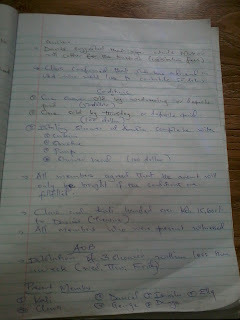 Notice the dance hall lights across the notebook...a little distracting during the meeting. This is the price we are setting for now until further notice. Two productive meetings with Sanergy’s operation and marketing teams today. 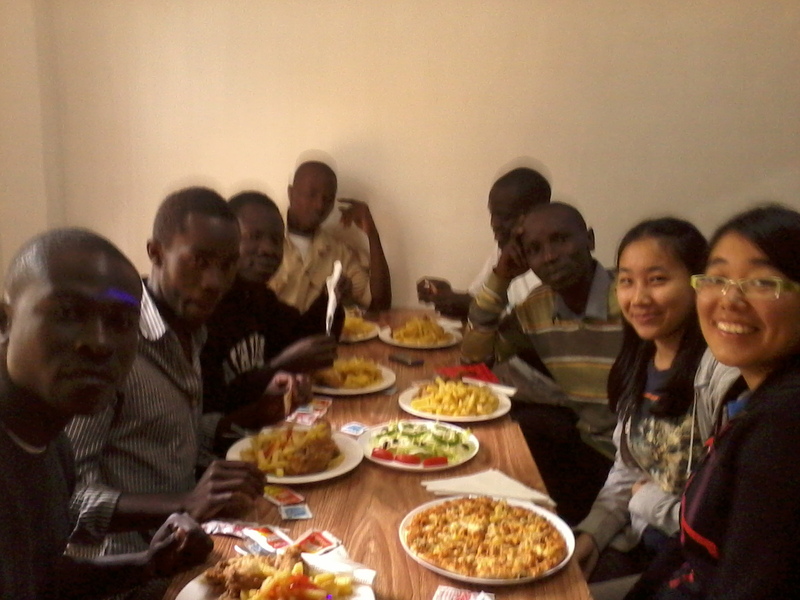 The first meeting was with Dennis and his operation team (4 people). George, Danga, Isaiah and Emmah brought a functioning shower to Sanergy so we were able to desmostrate to the operation team how the shower works for them to better communicate with the operators. They all looked excited about our shower and told us we start installing in two showers in operators’ plot (one with her own structure and one that needs our structure) for the one week trial. Our team went to meet the operator who owns a structure. They reported that the drainage system already exists in the structure and that it would be relatively easy to install the showers at her place. In between the meetings, we talked to Nathan and Mike. They suggested that we should focus on one of the two markets: either the operator or household. Since the functional requirement for the two markets are different. The operator would want the shower to come in a nice package. As long as the product is offers the customers a good experience and requires minimum maintenance on her part, they would not mind paying a slightly higher price for it. The households, on the other hand, are more price sensitive. They want convenience of having the shower in their own homes and do not mind doing a bit extra work (such as pumping). Looking at the requirements, it seems our product is more suitable for household or landlord for a plot. The pump we have is quite small so its easy to stall and suitable for one shower. The price is affordable to richer households or plots. But in any case, we think starting to work with the operators still has its benefit. We can see how operators react to our product and also use it as a tool to publicize to the local community about our shower. 1. Look the customers in their eyes when speaking. 2. Know your product very well to be able to take any questions they have. 4. Difficult customers can be better customers after you convince them than nice customers who always says ‘yes’. Danga had a chance to ‘sell’ the shower to Bonnie, the Sanergy’s best salesperson and got some valuable feedbacks. Hope this short but potent sales lesson prepares the team well to pitch to the operators tomorrow. 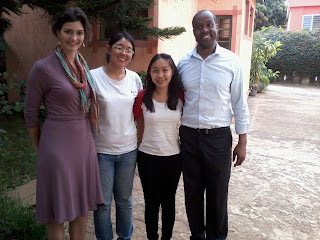 After meeting with Sanergy, Danga, Kali and I went to meet with Benson, the chairperson of Hope World Wide in Kwa Rueben. The center is very spacious, clean and well organized. Probably due to the many sponsors they have. 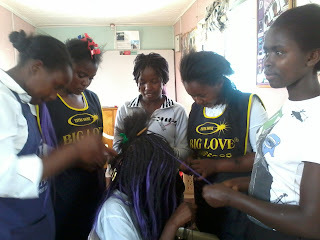 The center offers a wide range of services including free HIV testing, computer class, hairdressing (where I was very tempted to get my hair done) class, tailoring class and a clinic. They have a real basketball court donated by Coca-Cola. There is even a computer room with about 10 computers, just to play ONE computer game (they told us they do not have any other programs on the computer which I think is total waste of computers). It’s a role playing game that was suppose to help in behavior change (though Kali saw something about disabling the alarm on the game handbook so we are doubting about the effectiveness of the computer game on promoting good behavior). 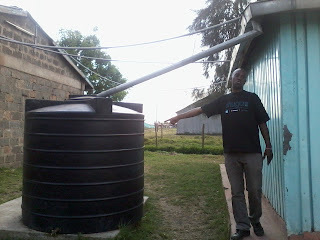 Benson pointing to us the rainwater collection system. There is a nice mural in the spacious meeting room. 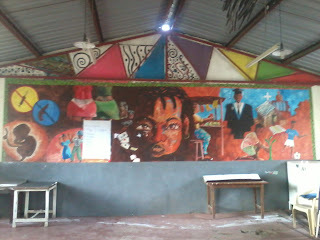 The left half of the mural indicate the problems that exist in the slum. 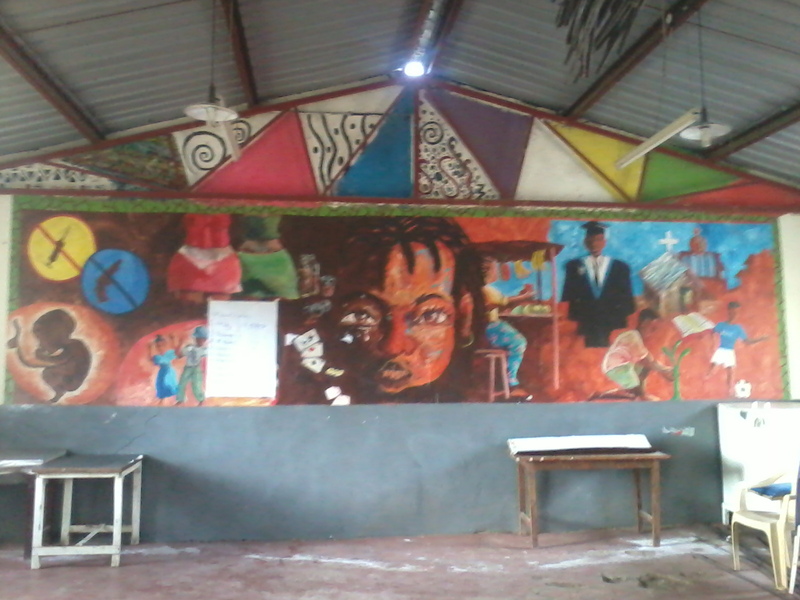 The right half side of the mural illustrate the vision for a better life in the slum. It is a very educational tour. We were surprised by how well off the center is. Seems like there is a lot of funding from overseas if one knows how to secure them. We told Benson about our shower project. 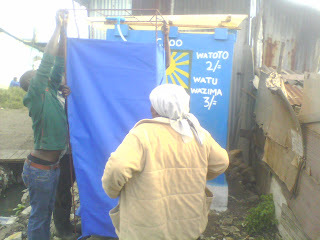 They can buy shower from us at a discounted rate of 3500KSH and sell it to the community at the normal selling price. They can keep the profit except they have to pay a 500KSH membership fee each month for the delivery and maintenance of the shower. Benson said that he will discuss with his manager and get back to us on Mon. We look forward to hear good news from him. 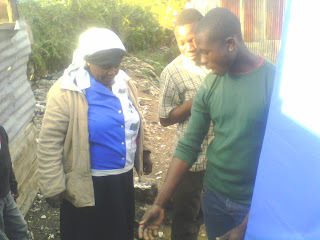 The other purpose for visiting the center was to identify potential project for EWB. 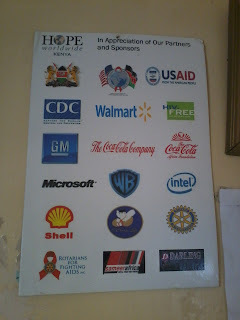 For the center, it seems we can do some computer related project since they already have the facilities. Not sure about the impact and scale yet. We will keep on looking when we visit other groups in the next few days. It was around 530pm when we wrapped up our meeting and hiked back to bus stop. 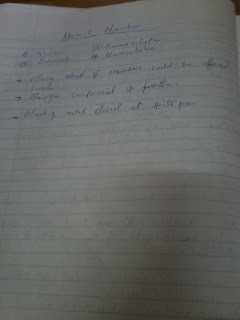 Warning to future EWB teams: DO NOT TAKE MATATU TO TOWN AT THIS TIME. The traffic is very bad. Our matatu stopped at National Stadium and refused to go further due to the traffic. We were stranded at the stadium for a while. The second matatu we went on was blasting radio at party music volume. The speed of the matatu is one tenth the speed of walking pedestrians besides us. 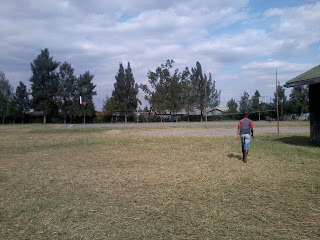 So we eventually got off the matatu and walked back to town. But we were back safe and sound. Ready for tomorrow’s adventure! We worked on T-shirt and business cards in the past two days to make the company looks more professional and make everyone on the team feels a sense of importance and belonging. Dennis, the field manager from Sanergy, has kindly helped us to identify three potential FLOs that we can put our showers. One FLO in Viwandani Area, and two in Kwa Ruben. They were chosen due to their current business and likelihood of incorporating showers next to their toilets. We are meet with Sanergy’s Field Managers/Operators tomorrow to tell them more about how the shower works so they would be better at assist in communicating with the FLOs. We are also going to talk to youth groups in Kwa Ruben for possible collaboration. Description of the Organisation: It is a FBO that offers: VCT, medical clinic, women's empowerment through vocational training in ICT and hair dressing, sporting activities, toilet All of its programs are targeted to HIV prevention in the community. They serve the whole community of Reuben. Description of the Organisation: They are a Christian-based youth group. They are a sports outreach youth group (previously they had been an outreach team). Most days they conduct their activities they attract young people only. 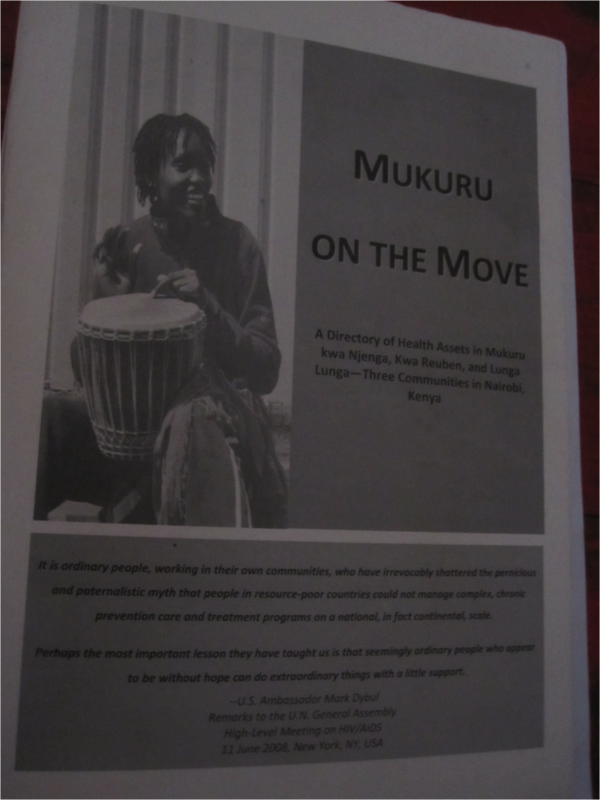 Description of the Organisation: The group focuses on HIV information and coordinates HIV testing in the Kwa Njenga community and peer education in schools. Description of the Organisation: It is a women's group but has incorporated men (6 men, 23 women) Members have attended workshops such as a Red Cross workshop where they were trained on fire issues. Organisation’s Vision/Future Plans: To supply clean water to the community at affordable prices. To have a grinding machine that will help them generate more income. Partners: The government donates the maize which they distribute to the poor and orphans. 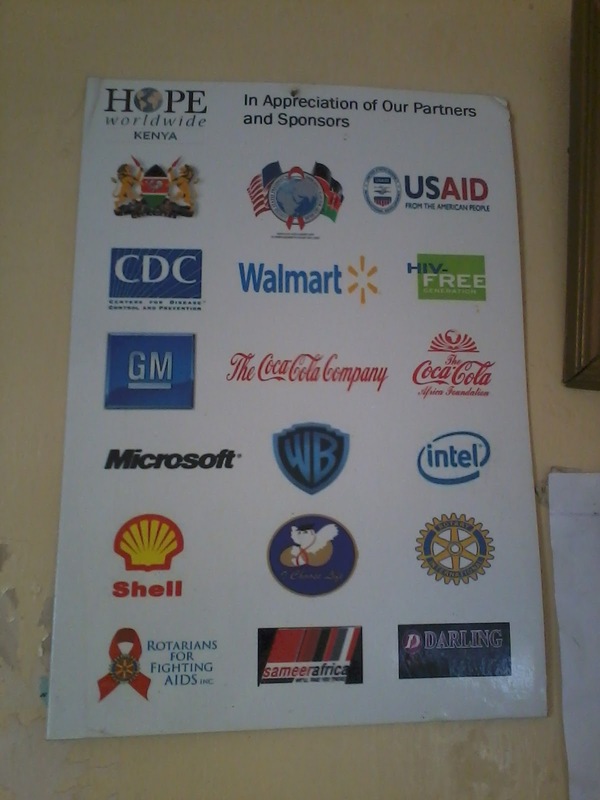 They also contribute 50 bob (50 cents) in order to provide food for people living with HIV. 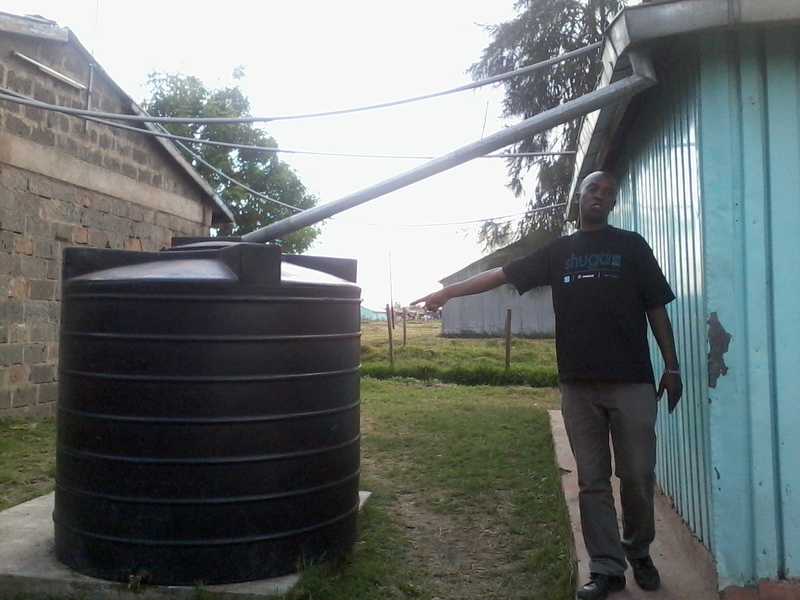 Organisation’s Vision/Future Plans: Have their own tank in order to supply clean and safe water in order to reduce the spread of typhoid in the area. Lastly, we are also looking for NGOs like Oxfam to schedule meetings to discuss possible fundings. On Thursday (the 9th), Clara and I left the team to work mostly on their own as we did some planning for the next few days. The team constructed eight more shower heads on their own and Davies bought two more valves. Davies, Isaiah, and Vivian did some more marketing to individual households, talking to 15 families and quoting a price of 4500 KSH. 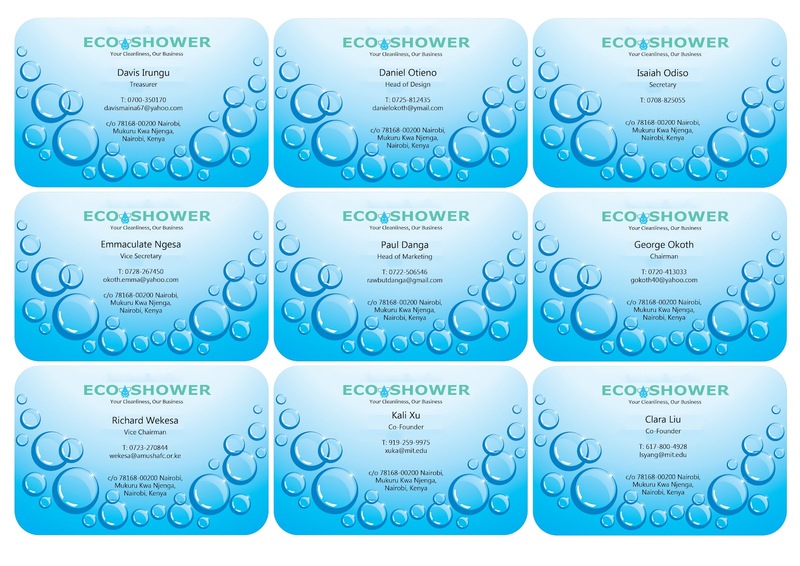 Out of those 15 households, 10 gave positive feedback about the product and price and showed interest in buying the Eco-shower. However, unfortunately, the times that the team is available to go talk to households is when most of the heads of households aren't at home, so none of the people they met (mostly women) could make a solid decision. Before we got there on Friday, the guys started experimenting with the structure design based on marketing feedback. 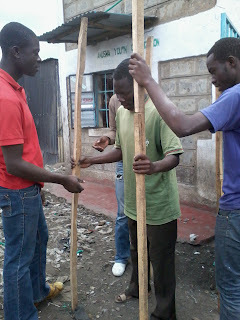 They'd bought some pieces of hardwood on Thursday and were already working hard on constructing a stand when we arrived. The team had good and bad news for us. Bad news first: the first family we'd installed a shower for had said they weren't using it because the wife didn't feel comfortable showering in such an exposed structure (when Clara and I talked to her earlier, she'd said she used it and enjoyed it), so the team took back the shower. There was a general desire for a more sturdy structure from the households surveyed, which is why the team decided to try out a wooden stand. The good news: they installed the first shower we built in George's home nearby, all tried it out, and loved it! George said he may even be our first customer. Later, when Daniel was free, we talked with him about contacting other youth groups. He showed us this directory of organizations in the area called Mukuru on the Move. 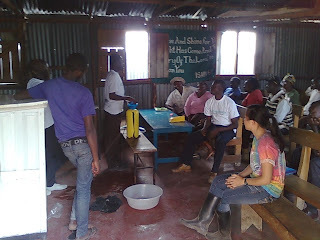 We set up meetings with Hope Medical Clinic and G-Thamini Youth Group in Kwa Njenga on Monday and then Hope Worldwide and the Heshima Disabled Self-Help Group in Kwa Reuben on Tuesday. We're hoping to talk to Sanergy's marketing team as well on Tuesday. 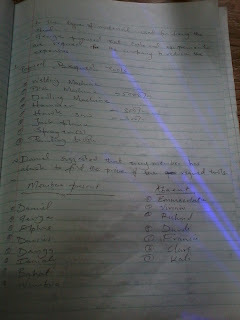 Daniel also explained to us how Amusha is organized and the leadership structure currently in place. He's the chairman, with Davies as treasurer and Richard as secretary. Our shower project falls under the project committee category. We decided that the exec team would consist of a chairman, vice chair, treasurer, secretary, vice secretary, head of marketing, and head of design. In the afternoon, we called everyone together for elections. Each nominee had 3 minutes to give a speech and then 2 minutes to answer questions. Some great discussion about the future of Eco-shower as a business rather than just a group sprung out of the Q&A sessions. We were really happy to hand over leadership to our new exec team, whom we have a lot of confidence in! George, Donga, Isaiah, Richard, Daniel, and Davies (listed left to right) introduced as the new exec team. Emmaculate, sitting next to George, is taking minutes as vice secretary. The first order of business that we brought up after exec selection was branding. We asked everyone to think about a logo and color(s) to paint the pumps. Before we start selling, we'd like to make sure this is settled so our product is recognizable and memorable (and as aesthetically pleasing as possible). 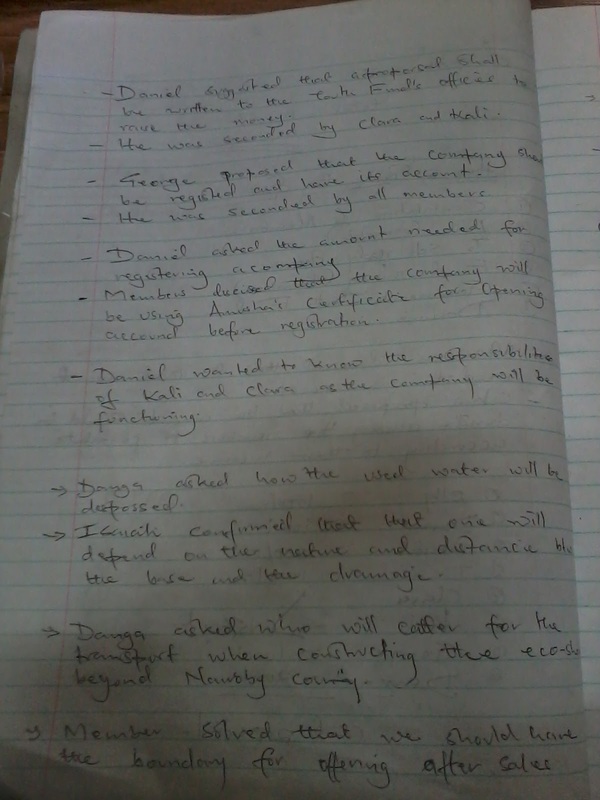 Since Davies is now the treasurer, he's in charge of handling the project funds, so we handed over 3000 KSH to him for paint and whatever materials are needed next. He has plenty of experience as the treasurer of Amusha, so we trust that he'll do a great job managing the money.